© 2013. Published by Canadian Human-Computer Communications Society. ISBN 978-1-4822-1680-6. This thirty-ninth Graphics Interface featured keynote speakers Gavin Miller, Adobe Research Imagination Lab and John T. Stasko, Georgia Institute of Technology. Sheelagh Carpendale, University of Calgary, was this year’s recipient of the Canadian Human-Computer Communication Society’s Achievement Award. 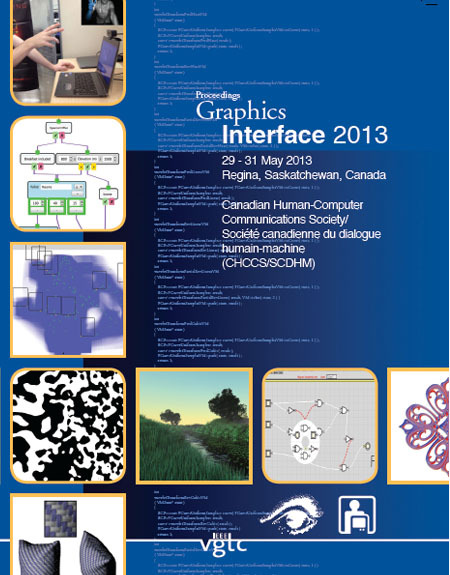 Also invited were Uta Hinrichs, recipient of the 2012 award for the best doctoral dissertation completed at a Canadian university in the field of Human-Computer Interaction, and Tyson Brochu, the 2012 recipient of the Alain Fournier Award for the best Ph.D. dissertation in computer graphics to present their thesis research.